Once again ladies and gentlemen, Earth experienced a blood moon. But this time, the red planet, Mars decided to tag along. Is there any significance to this recent event? I think so. Have you heard of it? Maybe you have experienced it. Blood moon burnout is what a lot of Christians may be feeling right now, because they already witnessed the no-show of the blood moon Apocalypse that was supposed to trigger the big one several years ago. A few people sold a lot of books on that topic and as you probably know, the end did not come like a few folks expected; neither did the Rapture. As a result, there may be a few Christians who became frustrated or embarrassed by the “alleged” non-event. Can you relate? If so, it ain’t over my friend. Prophecy has not been canceled. Jesus is still going to return, and when He does, there will be signs in the heavens. It will be a great show. The sky is going to erupt with fire, blood, darkness, and terror! So even though some of the previous blood moon predictions did not happen as expected, it does not mean that God will not use this heavenly sign when the earth reaches its final lap. By the way, I do not condemn those who missed their blood moon predictions, because in my opinion, I have to believe they were sincere and had good intent, (or at least I hope they did!) … And that’s the thing about end-time Bible prophecy, until Jesus returns, it is a work in progress. So yes, we saw a few blood moons come and go in 2014 and 2015, but I do not consider them entire failures. I still believe that those previous blood moons had prophetic significance. That’s a good question. But how do we know, “nothing happened?” What if those past blood moons were signs of things that are happening right now? What if their interpretations were wrong? What if God placed them as signs in the sky, but they were decoded incorrectly? Is this possible? I think so. Perhaps the purpose of a blood moon is to send a warning shot to notify us of things that are looming down the road. Which may mean that the blood moon is not necessarily meant to signify an impending event that will take place within days, but instead is the sign to warn us about events that are months or years away, rather than days away. Perhaps this is where the blood moon studies fell into error. ….Which brings us to the present. A few nights ago, there was another blood moon, and even though a lot of folks didn’t pay attention to it, I believe it has significance. This means that before the end, the heavens would reveal His warning signs…. They SHALL be there! And it also tells us something else, it is up to us to watch for the signs. Before I move on, please do not confuse what I am sharing with astrology. The practice of astrology is forbidden in the Scriptures. That’s not what I’m talking about. God tells us He placed the sun, moon and stars in the sky for signs and seasons. This is found in Genesis 1:14. We can find God’s use of heavenly signs throughout the Bible, from Genesis to Revelation. The signs of the times are before us, and on July 27, 2018, (Friday night) a major sign appeared in the heavens. The earth experienced the longest blood moon of the 21st century, (2001 to 2100). The total phase of the eclipse – called the “totality,” – spanned 1 hour 42 minutes and 57 seconds… that is almost 103 minutes. It was surely something to behold, but unfortunately, America did not see it, because this heavenly sign occurred during the day when Americans were not looking. That is little bit telling, don’t you think? 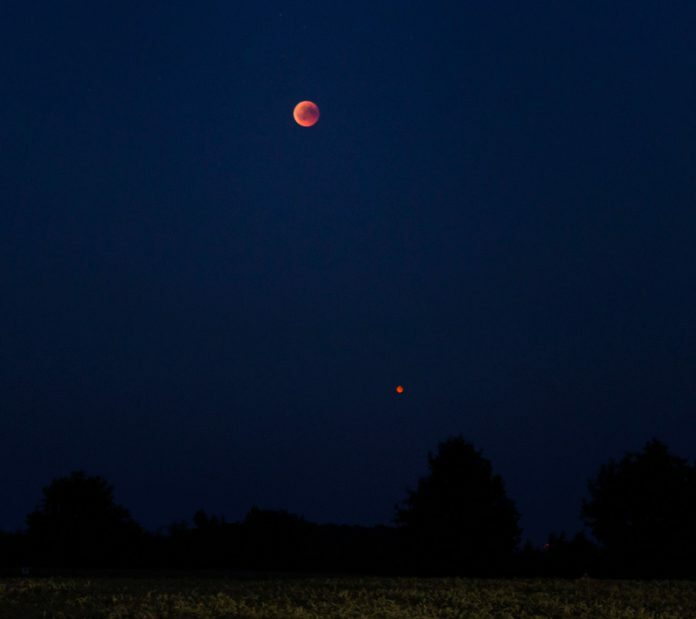 In addition, the sign included another major harbinger; Mars accompanied the moon as it experienced its closest approach to the earth in 15 years. This means it’s nearest distance to the Earth as it travels on its elliptical orbit around the Sun. The last time this happened was on August 27, 2003. Events like this are rare. Before the one in 2003, another one occurred almost 80 years previous on August 23, 1924. What does Mars have to do with this? It has a lot to do with it. The planet Mars was named after the god of war. This means Mars represents war. So according to the words of Jesus, a heavenly sign like a Mars convergence with Earth may have pertinence. In other words, if my observation about heavenly signs being tied to world events has legitimacy, then we would expect to see a connection in past history. And since hindsight is 2020, what would we find if we examined the Martian flybys of 1924, and 2003? If we went back in history, we should be able to find connections. … And that’s exactly what I did find when I began searching. As I just stated, a previous close approach between the planet Mars and Earth occurred on August 23, 1924. If my theory is correct, then we would expect to find pivotal events happening on, or around that time. Several months after the close approach on December of 1924, Hitler was released from prison and stated he would reform the Nazi Party, and invited all German nationalists to join the revitalized Nazi Party with him as its leader. A few months later, Hitler published Mein Kampf. So when we examine the converging of planet Mars (which represents God of War) with Earth in 1924, we can also see that 1924 was a pivotal year, because it released a beast upon the earth, whose name was Adolf Hitler. Think about that folks. Hitler’s rise took a few years. But the satanic principality who possessed him became involved with him several years before he invaded Europe. Hitler was possessed by a very powerful principality. It was wicked and had a thirst for war and bloodshed. So is it possible that the Mars convergence that occurred on August 23, 1924 was a harbinger of Hitler, and thus World War II? I believe so. Can I prove it? Well how does one prove anything in the spiritual realm? The spirit realm is invisible, which is why it is so important to have God’s discernment. When I look at history, I truly believe the spiritual realm has played a much larger role than most people are willing to consider. After the Mars convergence of 1924, almost 80 years transpired, and then another one arrived. President George W. Bush attacked Iraq in March 2003. A few months later he declared, “Mission Accomplished.” However, we now know that the mission was not accomplished back then, because the United States commenced a long drawn out occupation of Iraq and endless Middle Eastern wars. Another Mars convergence occurred on August 27, 2003. Was there a connection? I believe so. Again, Mars represents war. I find this interesting and compelling, because it illustrates that signs have been happening around us since the beginning of time, but mankind has not observed them. This is not new. Jesus noted this about the people of Israel during the first advent. Jesus rebuked them, because they were blind to the signs around them. God forbid that we make the same mistake. Jesus told us to watch for signs. Fast forward to the present. Last Friday night, the world witnessed a blood moon accompanied with a Mars convergence. Again folks, this was a very rare event. Therefore, wisdom requires that we take heed and try to understand it. The rest of the world saw it. But many Babylonian Americans were too busy celebrating their, “greatness” to notice it. Well, on the same day of that Mars converged with Earth, the headlines in America were celebrating the greatness of America where the economy, grew by 4.1 percent, while several hours later, at nightfall, an ominous sign appeared in the heavens. And granted, every one who is reading this must decide for themselves. As for me, I strongly believe there is great significance in these signs. Especially, when we include the planet Mars. Mars represents, “war,” ladies and gentlemen. Therefore, if this recent celestial event was a heavenly sign from God, it means that God is warning us that war is coming. When I examine the Martian convergence of 1924 in relation to Hitler’s rise, it gives me pause, because, “what if,” the heavenly sign was a warning to the folks back then? How many of them saw it? If I am correct about this, I believe that Friday’s celestial event was a marker to warn us about things taking place in the invisible realm. If we are truly in the last days, then we should anticipate that invisible entities of wickedness are getting situated with world leaders so that they can lead the world into war. Since I live in America, I expect no less in Washington DC. This includes the White House. I know some of you who are reading this are fond of President Trump, but as discerning Christians, we cannot allow political favoritism and bias to blind our vigilance. If we’re in the last days, and I believe we are, I expect to see Trump make a move toward war in the months or years ahead. Of course I must qualify this, with the disclaimer, unless he leaves office by resignation, a failed campaign, or anything else….. Otherwise, I expect to see some crazy things in our future. When I say, “crazy,” I mean, I expect to see a very confusing future for the United States, where horrible things you never thought possible will occur. Why do I say this? Well, my caution and concern about America’s future is based on evidence that I have acquired over the years which is both tangible and spiritual. I have seen too much, my friends. I have seen the flames. I have seen the burning cities. I have seen the war that is coming. I have seen the faces of soldiers who were in shock. I saw the civil unrest. The bloodshed. The tanks and the planes. I saw the missiles flying. I saw the mushroom clouds. I saw the horror, the terror, and I heard the moans of grief and sorrow. Some people hate me, because I don’t adhere to their politics. Others despise me, because I expose the real truth about Trump. But I have seen too much, my friends, and how can I deny it? The delusion is here, and I’m just trying to rescue a few souls to escape it. Why? Because I have to. That’s what I do. Note – If you appreciate our efforts to warn the people, we appreciate your support. Your generosity helps to make this possible.